"This torte is legendary at work; one time it caused a near riot and disappeared in 5 minutes! It's very unusual and tastes like those small butter/nut cookies rolled in powdered sugar. It's not hard to make, it just takes some time, but I guarantee it's worth it!" In a large bowl mix the flour and white sugar together. Cut in the butter or margarine with a pastry blender or two knives until mealy. Stir in the unbeaten egg and mix with your hands until dough holds together. Divide dough into 7 equal parts. Roll each part into a 9 inch circle on a lightly floured non-stick cookie sheet. (Cookie sheets need to be without edges so you can roll out cookies on the cookie sheet as you can't transfer cookie after it's rolled out.) If the cookie edges get uneven while rolling out, just push them back and roll again until you get a fairly even 9 inch circle. Bake at 350 degrees F (175 degrees C) for 10 to 12 minutes, until lightly browned on edges. Cool and remove gently. 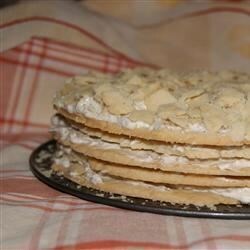 To Make Filling: Combine sour cream, confectioner's sugar, chopped walnuts, and vanilla and mix until smooth. Divide filling into 6 equal portions. Assemble cookie layers by putting filling between cookie layers, stacking up as you go. (The 7th cookie sets on top of the stack; there is no sour cream filling on top of it.) Sift confectioner's sugar on the top cookie. Refrigerate for at least 5 hours or longer so the whole thing can meld & mellow together into a "cake-like" torte. Cut into wedges and stand back while everyone goes NUTS! Too much work for "so-so" results. Difficult to cut and equally difficult to eat. The filling was good, I think I'll try to use the filling in a different recipe.